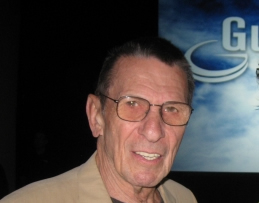 "Keynote Address: Leonard Nimoy, Acclaimed Actor, Director and Photographer: 'Horses, Trains and Spaceships'"
Leonard Nimoy’s life is one of seemingly small opportunities seen, seized, and turned into huge payoffs. But it is also a life guided by several powerful principles. The sense of honor he gained from his two years in the military. The appreciation for how the little things, the small moments – like a chance exchange with John F. Kennedy after an even more serendipitous cab ride together – can have an outsized impact and literally change your life. The realization that we all have some bit of creativity within us – we just need to take the path of discovery, and learn how to tap our creativity and where best to apply it. For only by finding our creativity and successfully applying it can we truly "live long and prosper." "Then my father gave me some advice, the only piece of advice he ever gave me. He said ‘Learn to play the accordion. You can always make a living if you can play the accordion.’"
"In search of honor, I got on a train and went to that citadel of honor: Hollywood." Re: Picking up John F Kennedy in LA while driving a cab: "Your business [acting] is a lot like mine. But keep in mind: There’s always room for another good one.’ And that made a big impression on me." Leonard Nimoy - the most quotable man yet! Leonard Nimoy speaks not only about his experience bringing to life "Spock," but also about how he made ends meet pre-Star Trek (stints in Bonanza and taxi driving), advice he received from his father and never followed ("learn to play the accordian"), and what virtue motives him the most ("virtue"). Simply unforgettable! Confluence 2009 - Gallery There is a video, but I can't get it to work. Update: venusgreenlove at Tumblr got the video to play (which by this appears to be region blocked and only available in the U.S.) and gave us this summary. Mr. Nimoy’s talking about the JFK quote and how you have to put yourself in the work-things he’s mentioned before. His voice sounds a little softer than usual. Update No. 2 mrssylargray made the video available on her YouTube channel. Many thanks to the two of you! 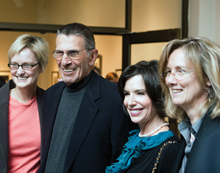 In February Mr. Nimoy spoke about his photography at the University of Alabama. Though perhaps most well known for his role as Mr. Spock in the Star Trek TV series and movie franchise, Leonard Nimoy also enjoys a career as a photographer. On February 6, UAB hosted the acclaimed actor and artist at the UAB Visual Arts Gallery as the Department of Art and Art History’s 2009 John Morton Visiting Artist. Nimoy’s interest in photography began in his teenage years, and he later studied the subject at UCLA in the 1970s. His works include “The Full Body Project,” an examination of concepts of beauty and sexuality, and “The Shekhina Project,” a work about the feminine essence of God. 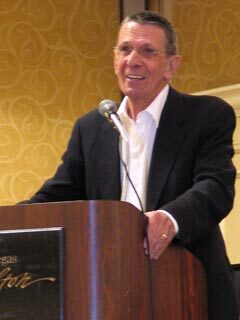 Leonard Nimoy was the keynote speaker at the Guidance Software ninth annual Computer and Enterprise Investigations Conference. According to bowtielaw's blog his "personal story of 'trains, horses and starships' was extremely entertaining. 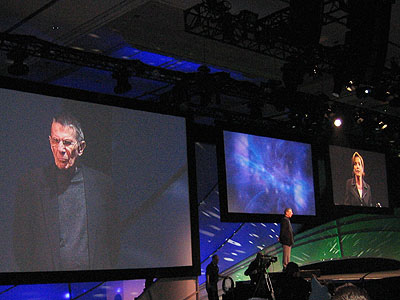 Leonard Nimoy announces the companies design contest winners. Nimoy and his wife spoke about how they came to become avid art collectors — their interaction was sweetly and sincerely affectionate, underscoring their shared passion and hands-on approach to their acquisitions. The two spend hours personally touring artists’ galleries, selecting and compiling pieces for their private collection (presented in slide show photos of their home) guided primarily by how the work resonates with them, rather than by adhering to any specific trends, style or genre. In his blog bytemarks writes about the event: "One of the highlights of the show and a first in my life, is I got to see the legendary Leonard Nimoy of Star Trek fame live on stage. This is a geek's dream come true, to be at a tech conference and unbeknownst to anyone, Nimoy beams on stage for a short skit with Cisco's CMO, Sue Bostrom. Bostrom made it appear to be a technical difficulty when all the lights went out and Nimoy materializes behind a wall of smoke. Nimoy did a bit of Spock character role playing and said that Cisco's Telepresence technology was the precursor to the Transporter. I thought it would have been more appropriate to make the comparison the the Holodeck, when I remembered that the holodeck did not come into play until Star Trek: The Next Generation. 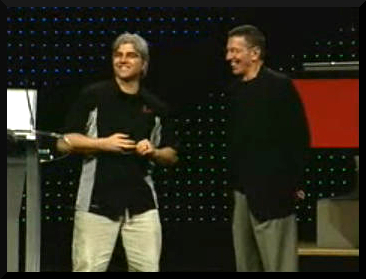 No sooner than he appeared, Nimoy was wisked off stage so Bostrom could get on with the real presentation. (...)"
STARTREK.com reports that "Leonard Nimoy will present his one-man multimedia show 'See What I See: Shekhina' this Saturday evening in the Santa Clarita Valley, just north of Los Angeles. He will appear at Congregation Beth Shalom on October 21 at 8:00 p.m., as part of the synagogue's Distinguished Speaker Lecture Series. This presentation is similar to the one Nimoy made at the Creation Las Vegas convention last August, where he said that his photography work, which in large part explores the feminine aspect of Jewish mysticism, 'is singularly personal to me. I learn every day something about the world in which I live, the society in which I live, the culture in which I live, and I learn about myself each day'." The NASA Marshall Star writes: “'Delivering Technology Today - Developing Technologies for Tomorrow,' was the conference theme this year. The Huntsville Association of Technical Societies (HATS) sponsors the Technological Excellence in Aviation, Missiles, and Space (TEAMS) Week. 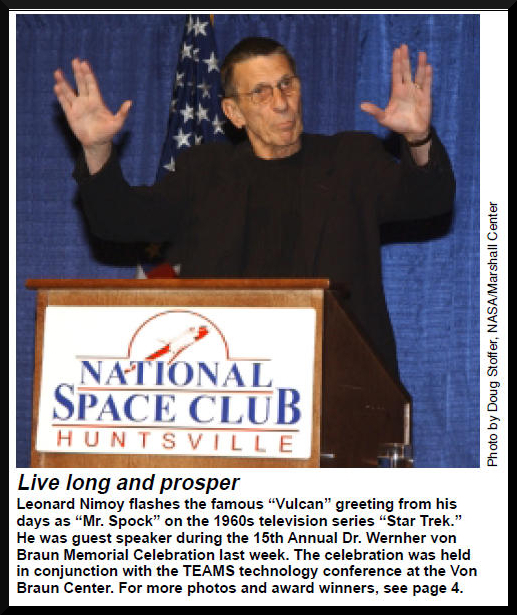 Part of the week was the 15th Annual Dr. Wernher von Braun Memorial Celebration dinner featuring Leonard Nimoy of “Star Trek” television fame as guest speaker. " April 10, 2003. Newspaper article and interview from the Fayetteville Observer about the talk he gave about Star Trek, the transformation that takes place when the make-up is put on and the misunderstanding the title of his book I'm Not Spock caused. Mr. Nimoy spoke about his poetry, scientific experiments on plants, UFO's, Science Fiction and how it relates to the here and now and Star Trek. This probably made for at least a partially unfriendly atmosphere in some quarters of the auditorium and any joke, remark or gesture could easily be taken the wrong way. (Wonder if that had anything to do with him campaigning for McGovern while the college was a more conservative one?) Given that anybody can have a particular bad day, he and the audience seem to have gotten off on the wrong foot. “Nimoy Gives Inside View of Acting.” Nevada Daily Mail [Nevada, MO] 4 Apr. 1973: 9. Google news. Web. “Personal Mentions.” Nevada Daily Mail [Nevada, MO] 4 Apr. 1973: 3. O’Leary, Karen. Personal interview. 2-3 Apr. 2010. Jiner, Randy. Personal Interview. Feb. 2011. The honorees and their representatives will be introduced at a formal dinner and awards ceremony at the Essex House in Lancaster Sept. 17. A public unveiling of plaques honoring each of the veteran test pilots will take place at 2 p.m., Sept. 18, at the Performing Arts Center, Lancaster. 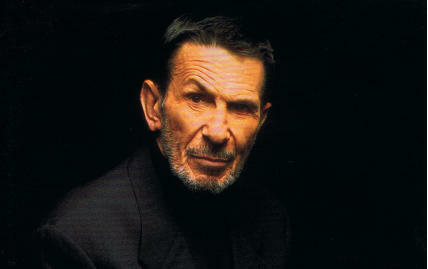 Featured speaker at the afternoon event will be Leonard Nimoy, of Star Trek television fame." NASA, Dryden X-Press, Septemper 1994.